WDC's Noah Ross signing his letter of intent to play basketball at the College of St. Scholastica in Duluth. At left, sitting, is Noah's dad, Kevin, and at right, Noah's high school basketball coach, Kevin Tumberg. Back, middle and right, are Noah's grandparents, Nina and Jim Overland, and at left, Norm Gallant, WDC Activities Director. Wadena-Deer Creek senior Noah Ross has signed a letter of intent to play NCAA Division III men’s basketball at the College of St. Scholastica in Duluth this fall. The 6’2” standout shooting guard averaged 20.5 points and 3.5 assists per game for the Wolverines. 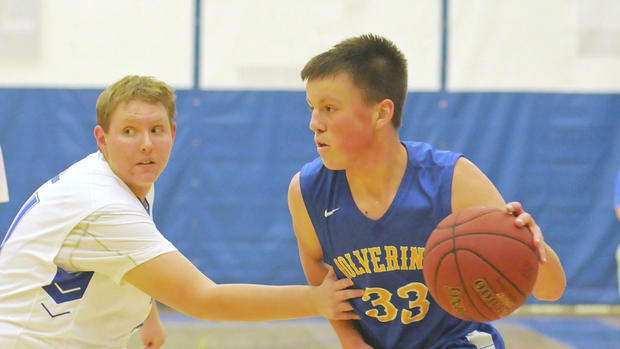 Ross hit a career milestone this past season when he became the all-time leading scorer for the Wadena-Deer Creek Wolverines boys’ basketball program, breaking a 30-year record, and finishing with 1,413 points. Ross said he chose St. Scholastica because he likes the Saints’ strong team approach and work ethic. “They follow the saying ‘all for one and one for all’ and I like that tradition. One of the players said, ‘This season – championship or bust!’ so you know everyone is going to work their hardest and I want to be a part of a team like that,” Ross said. Ross said he was also impressed with St. Scholastic’s science program, since he is pursuing a pre-med degree and hopes to one day be a radiologist. “They have a really good science program. They have a lot of resources, like a cadaver lab, which is awesome,” Ross said. In basketball this past season, Ross earned several distinctions including Park Region Conference Boys’ Basketball Player of the Year, Brainerd Dispatch’s All-Area Boys’ Basketball Team and the recipient of the MN Basketball Coaches Association’s "Academic All-State" Award for Class A & AA schools. WDC head boys’ basketball coach Kevin Tumberg has coached Ross for the past four years as an assistant and head coach. He said he’s very excited to see Ross play college ball at St. Scholastica. “Noah has put in the work to get him to the next level of basketball. He knew he wanted to play ball in college and he did everything possible to get himself there. The Saints are adding a tremendous player, leader and character guy to their roster. I am extremely confident that he is going to find success there, on and off the court, and I look forward to seeing that happen,” Tumberg said. Tumberg described Ross as a smart and perceptive player/coach on the basketball floor. “It is almost as if having a coach on the court when Noah is playing. He is able to see and dissect things as the game goes on. His basketball IQ is very high and he is continually trying to improve those around him. He has shown tremendous growth throughout his high school career, and I know this growth will continue into his collegiate career,” Tumberg said. Ross also participated in cross country and baseball for the Wolverines. His fine-arts activities include playing percussion in pep band, jazz band and concert band, as well as participating in the concert choir. Ross's school activities include National Honor Society, Knowledge Bowl, Peer Mentoring, being a class officer and he also maintains a 3.9 GPA. Noah is the son of Kevin and Sara Ross of Wadena. Noah has an older sister Gabi, who is a freshman at the University of Minnesota, and a younger brother, Phillip, a seventh-grader at Wadena-Deer Creek Middle/High School.